was a Japanese Buddhist monk, who was born in Hino (now a part of Fushimi, Kyoto) at the turbulent close of the Heian Period and lived during the Kamakura Period. Shinran was a pupil of Hōnen and the founder of what ultimately became the Jōdo Shinshū sect in Japan. Shinran was born on May 21, 1173 to Lord and Lady Arinori, a branch of the Fujiwara clan, and was given the name Matsuwakamaro. oshichiya, o-shichi ya 御七夜（おしちや） "seven nights"
temple Narutaki Ryootokuji in Kyoto 京都鳴滝了徳寺.
. Reference : Hoonko service for Shinran . how much more so the evil person." A preeminent work in the Shinran exhibition is "Portrait of Shinran" (1255). 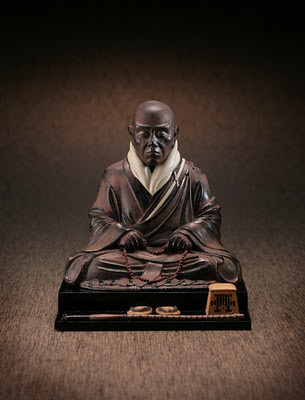 It depicts an 83-year-old Shinran sitting on an animal pelt, an accoutrement of itinerant priests that allowed them to sit anywhere to dispense their doctrine. 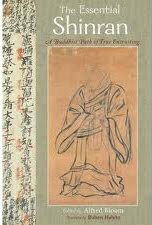 Such aspects of quotidian life were distinctive of new Buddhist portraiture and were no doubt indicative of the religion practiced among the people rather than that practiced in cloistered confines. Such portraits are concerned with likeness and prone to distortion. One leaves these exhibitions with similar thoughts on religions. This haiku has the prescript, "Zenko Temple." 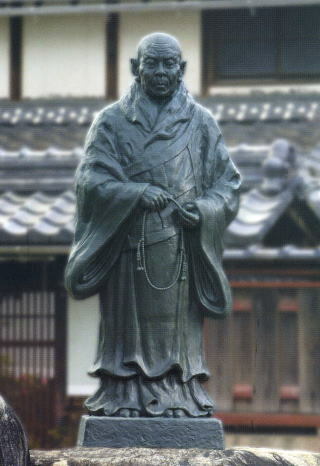 Shinran was the founder of the Jôdo shinshû branch of Buddhism, Issa's sect. When he visited Zenkôji, Shinran planted the branch of a pine in a large pot in the main hall-- a plant which, evidently, was still alive in Issa's time, over 500 years later. (Nagano: Shinano Mainichi Shimbunsha, 1976-79) 3.352, note 4.
. Tr. David Lanoue .
. Tannishō 歎異抄 Tannisho and priest Yuien 唯円 .
. Personal Names used in Haiku . Thanks for posting this interesting scoll photo. There is another legend about a growing walking stick told by Yanagida Kunio. at the temple 妙宣寺 Myosen-Ji around 1355 Priest Daikaku 大覚僧正 (1297 - 1364) of the Nichiren sect planted his walking stick into the ground. It became bamboo, but a special sort called sakasadake 逆さ竹 "upside down bamboo", with its branches hanging down. A kind of hachiku 淡竹 bamboo. 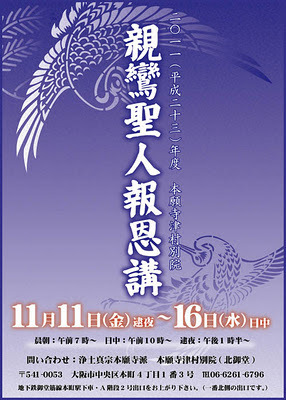 A similar legend is also told in 新潟　Niigata at temple 西方寺 Saiho-Ji about the Nichiren priest 親鸞聖人 Saint Shinran. sakasadake 逆竹 Sakasa-Dake, "weeping bamboo"